Our April update features a rather large version of the ever popular ""Chrysanthemums" flower basket picture produced by the Buchschmid and Gretaux Wood Inlay Company in the late 1950's to early 1960's. 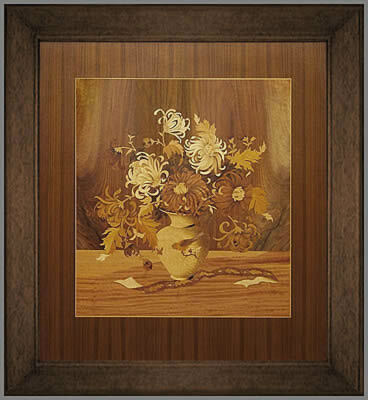 As we say, this version of the Chrysanthemums wood inlay picture is not the usual 29 x 25 inches, this one measures 33 x 30.5 inches - which is more than 4 inches larger all round. This superb example of the Buchschmid and Gretaux Wood Inlay picture work is owned by Karen Healy. Karen actually has every piece of the original paper work in her possesion, which is unusual after nearly 60 years of the picture's existence. Karen's parents purchased this picture around 1960 while in Germany. The paperwork, being printed on wood pulp paper is obviously a wee bit fragile now, but it is a wonderful historic set of documents nonetheless. We have taken the liberty of copying out the text from the document which tells the story of how the wood inlay pictures were made in those days. The process is somewhat different to today's practices, but the principles are still the same. It is interesting to note that Buchschmid and Gretaux worked on the inlay from the reverse and then flipped it when they mounted the inlay to the baseboard. The reason for this we assume is that the clean "unworked" side of the inlay now becomes the front and all the glue and tracing lines are now hidden on the side of the inlay which is affixed to the plywood baseboard. The following description explains to you the process of making an inlay picture. the process for tables and trays is very much the same. After carefully scrutinising the possibilities of a scenery for the specific requirements of inlay work an artist first designs the contours of the picture on transparent paper, in lines only, without shadows. Blueprints of this drawing are then cut apart into all the pieces which later in the finished product will show the different wood colours. Each one of these pieces of blueprint is then pasted onto a selected piece of the right veneer taking care of desired grain structure and direction, and on a jigsaw cut to the exact shape according to the confining lines on the blueprint. 20 to 25 different veneers and 200 to 300 pieces in all are used for one picture. After cutting these pieces are assembled by gluing them onto a piece of paper in the reverse sense of the intended picture. Both. this paper and adhering pieces of veneer are turned upside down and the veneer side, under heat and pressure, glued onto a piece of quarter inch plywood, while at the same time another piece of veneer, which later forms the back of the picture, is glued onto the rear side of the plywood. The plywood originally consists of six layers of veneer, with grains running across and diagonally to each other. The finished picture therefore is eight fold plywood, after addition of the picture layer and the back layer. After this gluing process the picture layer that shows now on top is carefully sanded away. Under it there appears the reverse picture in the reverse sense, i.e. the same as the original drawing. Now four coating of varnish and polish are hand applied, French fashion, with two weeks in between each coating to get hard. Then the picture is framed, insulated against humidity seeping in and there is the finished product. Everything is hand work of the highest skill, all materials are of the very best quality available, all colours are natural wood shades with occasional sand burns for rounding effects. Click the above button to return to page 63 of "Can You Help"